The following piece was published last summer in La Tempestad; given that La Tempestad circulates primarily in Mexico and is published in Spanish, we — Rob Holmes and I, who co-authored the piece — thought that it would be worth re-publishing it on our respective sites for English-language audiences. 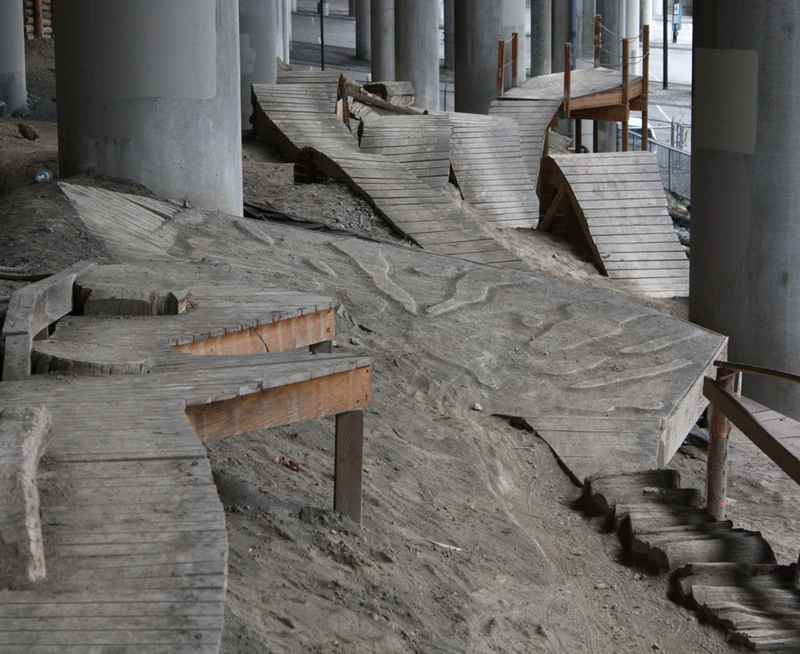 The article builds on a pair of posts from about two years ago: first, a post here describing a visit to I-5 Colonnade Park, and second, a post at mammoth that described Colonnade Park variously in terms of an “infrastructural vernacular” and Brian Davis’s formulation of “leisure-work” landscapes. In the text below, we move beyond these initial reactions to argue that Colonnade Park suggests an alternative to the dominance of the capital project in landscape architecture, an alternative that opens up new aesthetic and performative domains based on difference, variability, and the agency of both individual and communal labor. 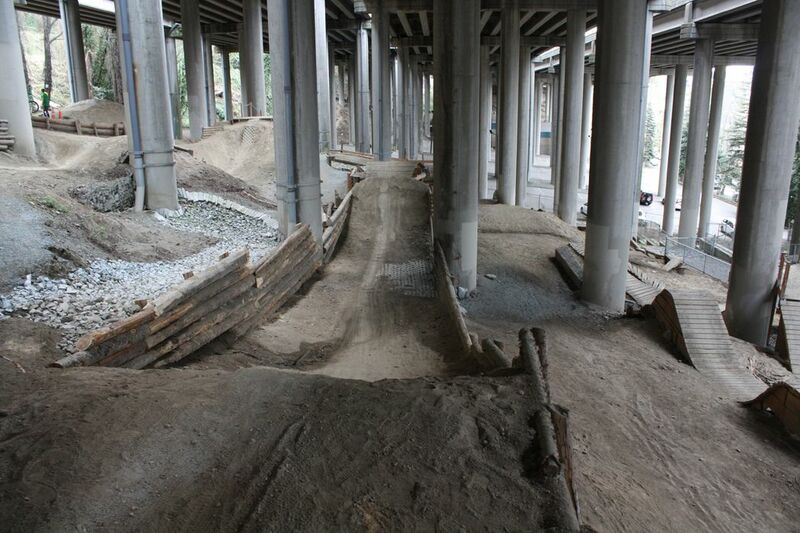 Beneath the deeply-shaded underbelly of an elevated section of Seattle’s I-5 freeway, Colonnade Bike Park tumbles freely downhill across steep and jumbled terrain, occupying formerly barren and listless ground. 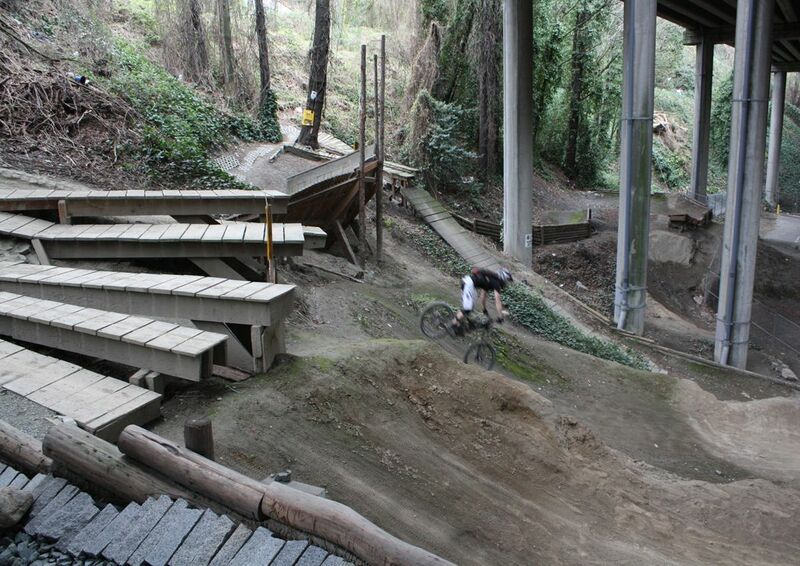 Ramps, berms, drops, and various homespun earth-retaining systems slip between the industrial cathedral’s neatly-spaced namesake concrete pilings, aggregating into roughly pixelated surfaces, which in turn form a series of circuits for the local mountain biking community that designed, built, maintains, and rides in the park. Like the tricks pulled by the bikers careening across its wood, concrete and earth, the park feels improvised. Much of the material to build it was donated or recycled from demolition projects around the city. Sandstone pavers torn out of cobblestone streets that linked the neighborhoods east and west of the park before the freeway viaduct split them were donated by the Seattle Historical Society. Antique Douglas Fir joists and framing were donated from a renovation project a local mountain biker was working on. A logger friend supplies the Park with a steady supply of “mill reject cedar logs”, logs which are too large, too small, or too deformed to meet the standards of commercial cedar processing. Scraps — pressure-treated lumber, fasteners, and other materials discarded on local construction projects — are brought to the Park and recycled into tracks, jumps, drops, and wall rides. Ordinary off-the-shelf items have been retooled, like the permeable concrete waffle pavers that have been converted into ad-hoc cellular confinement systems. The accumulated effect of this process of ceaseless improvisation — the Park’s two acres took roughly four years to construct and design is ever ongoing– is a distinctively raw aesthetic. Like many contemporary urban parks, including New York’s (over-)celebrated High Line, Colonnade Park draws much of its aesthetic appeal from the character of the industrial infrastructure it shares space with. 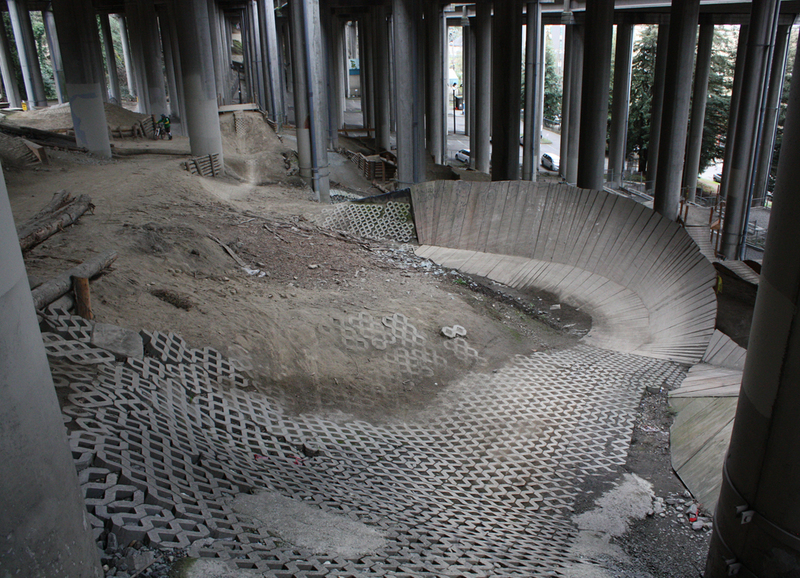 Yet rather than introducing crisp contemporary minimalism to contrast with that infrastructure, as many of its more famous contemporaries do, the decisively functional arrangement of the Park’s angled planes of waffle pavers and bermed piles of recycled dirt amplifies the raw instrumentality of the viaduct above. But, as appealing as it is, the lo-fi aesthetic of these pragmatic and hand-made constructions is not the most important lesson of the Park. What Colonnade Park suggests is a re-orientation of the practice of landscape architecture away from faceless capital and towards creative and vested labor; away from design elitism and towards the participation of the users of a landscape in its construction; and away from standardization and mechanization towards difference, variability and the instantiated volition of the individual laborer. Public urban landscapes — parks, plazas, squares — are often referred to as “capital projects” by those who build them — politicians, developers, architects, construction firms, planners, contractors, and so on. The use of that particular term recognizes the central mobilizing and productive role of capital in their construction. When capital plays this primary role, the quality of a landscape is understood to be determined in large part by the quantity of capital that can be devoted to it: to “upgrade” a plaza is to replace cheap concrete and unit pavers with expensive stone, wood, and metals; to spend more money is to improve. At the same time, to hold down costs for the production and installation of materials, standardization is essential, and where difference is introduced — in the algorithmic variations common to parametric design, for instance — it is introduced most often at the production stage, where capital is most easily applied. Colonnade Park presents an alternative. The Park was built with relatively minimal funding, using refurbished materials. But because of the massive quantity of skilled volunteer labor available, those materials have been fitted together in almost endlessly variegated combinations. As the volunteers who built the park are mountain bikers who wanted to ride in it, the Park is deeply customized to the spatial practices situated within it. Thus the shift from a capital-intensive landscape architecture to a labor-intensive landscape architecture is enabled by the presence of an interested and knowledgeable community which is willing and able to labor in a landscape voluntarily and without pay, for the rewards contained within and produced by that act of labor. This is a different kind of labor, and it heralds new possibilities for landscape design. To understand these possibilities, it may be helpful to think briefly about the intertwined history of labor and landscape. 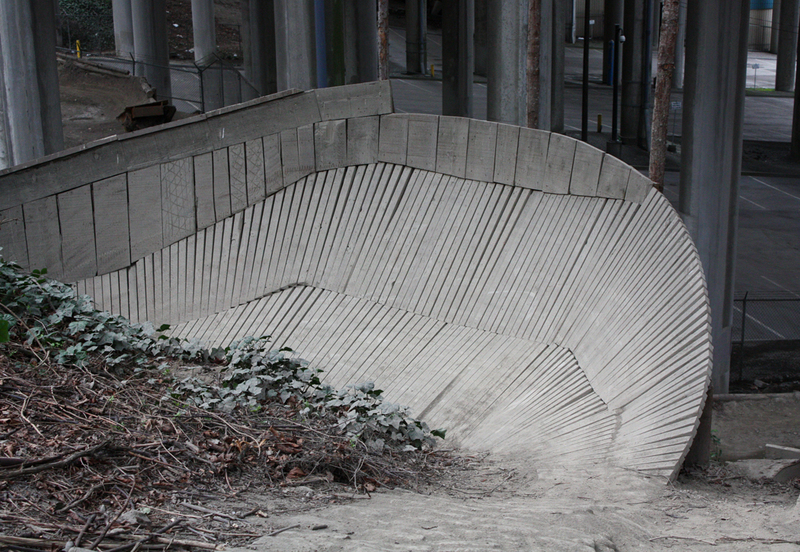 Perhaps more than other forms of design, labor and landscape are co-generators of one another. Human behaviors and landscape processes feedback on one another, as the literal liveliness of the materials used to construct landscapes — most obviously, plants, but also animals, fungi, bacteria, insects, and even inanimate substances like sediments, soils, and water which nonetheless possess aggregate behaviors — requires that constructed landscapes are continuously maintained and always evolving, in a struggle between growth and entropy, which are not always easily distinguished. This process of continuous maintenance is not necessarily capital intensive, but it is typically labor intensive. 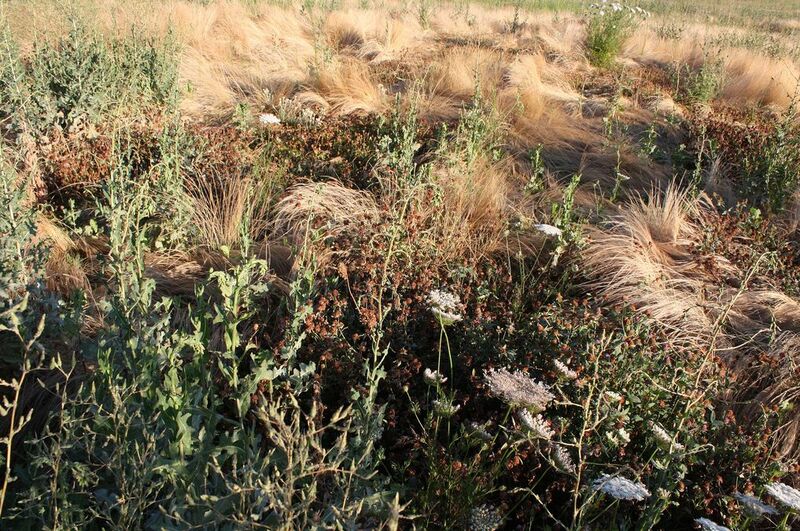 Think of the difference between the process of weeding a garden by hand and maintaining a strip mall planting buffer with weed-whackers and leaf blowers; think of the delicacy and intricacy of the former landscape, and the bluntness of the latter. Viewed from a historical perspective, the contemporary capital project, with its emphasis on the agency of capital over labor, is an aberration. From the construction of pyramids in Egypt and Mesoamerica, to Roman villas and Qing dynasty gardens, to Bramante and Ligono in the Italian Renaissance, or even Humphrey Repton and Capability Brown in Romantic England, the practice of both monumental and ornamental landscape modification was long defined by a reliance on the mobilization of vast quantities of (often subjugated) human labor quarrying stone, pruning trees, excavating earth. At even broader spatial and temporal scales, the aggregate effects of persistent labor have historically produced some of our earliest and largest geo-biological impacts: terrace cultivation on hillsides in China and the Andes, the pre-Columbian transformation of North American biomes through the persistent annual application of fire, the co-evolved hedgerow ecologies of Western European farmland, and even, as recent archaeological evidence suggests, the fertile, anthropogenically-induced “terra preta” soils of the Amazon. 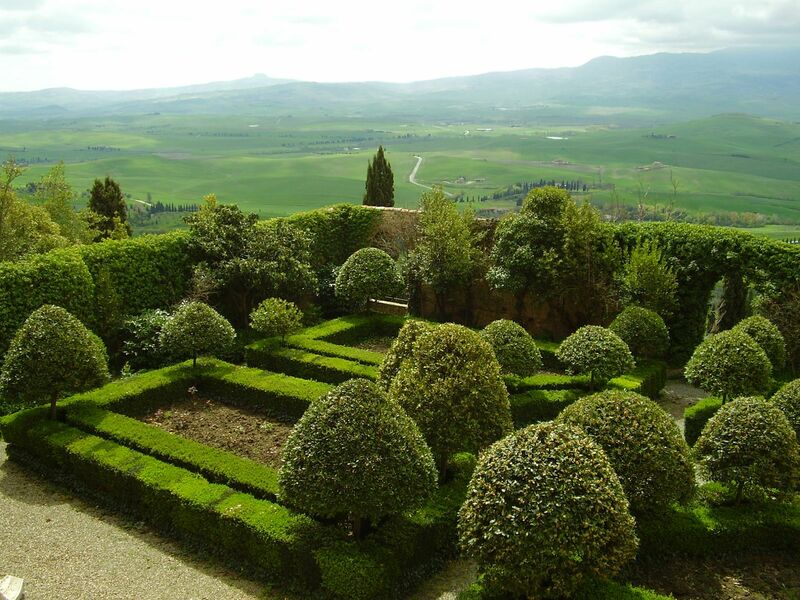 Perhaps the most extravagant examples of labor-based landscape modification are the incredibly maintenance-intensive geometries of Baroque gardens, most prominently found in France and Italy. Intended to realize a peculiar set of ideas about the relationship between symmetry, geometry, and the proper ordering and control of both the physical and moral universes that were endemic to that time and place, the Baroque gardens employed armies of skilled and semi-skilled landscape laborers in long struggles against the unruly entropic tendencies of boxwoods and poplars that were constantly trying to escape their confinement into crisply rectilinear parterres, bosquets, and allees. But setting aside the specific philosophical motivations of these gardeners, though, it is not difficult to imagine an alternative Baroque — perhaps we will call it the Ecological Baroque, or the Performative Baroque — equally extravagant in its application of labor to the transformation of landscape, yet aimed towards the realization of an entirely different set of ends: the enhancement and growth of ecological productivity. To envision this Performative Baroque, imagine swarms of volunteer gardeners, acting in concert to re-make the floral composition of an urban landscape. Harvesting one set of urban voids for fast-growing grasses and perennials whose biomass can be converted into fuel. Seeding roadbanks and railways with erosion-halting vegetation. Setting up watches over cryptoforests and freakologies to record patterns of interaction between fauna and flora, and then establishing botanical kill lists of species to be removed for their lack of utility, while encouraging others that host a particular insect species which is struggling. 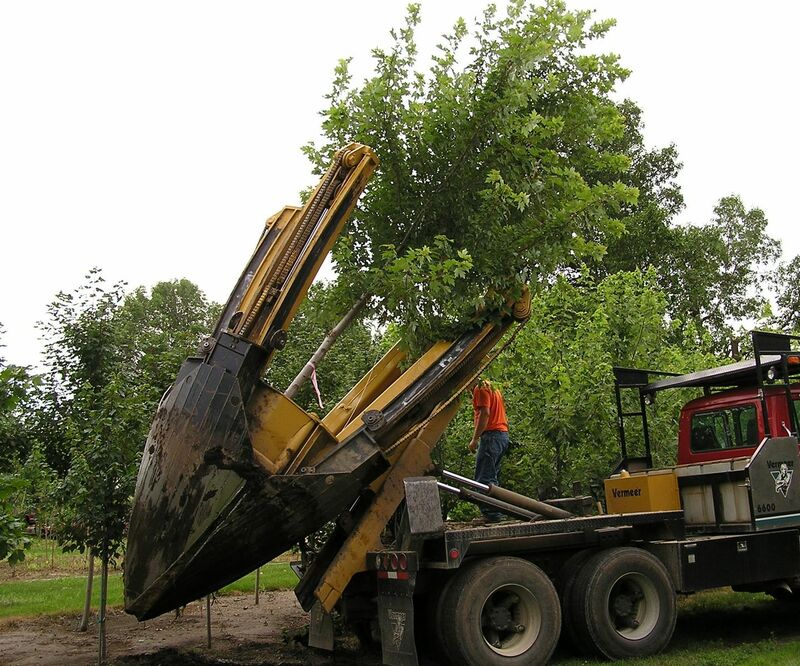 Instead of trucking in groves of “native” trees and burying elaborate irrigation prostheses to support them, as a capital-intensive landscape architecture does, these landscapers would curate the slow successional evolution of new forests on abandoned lots, terrain vague, and infrastructural leftovers. The city would be their garden. This picture reveals a critical difference between the historical pattern of landscapes produced by an extravagance of labor and a future turn back towards labor, a crucial difference between the hands that carved the Baroque gardens of Vaux le Vicomte out of resistant plants and the mountain bikers who hammered together Colonnade Park. That difference is that the historical pattern is of involuntary labor — at best, wage labor, performed at the behest of a benefactor able to afford wages in the pursuit of some vision — but a future turn towards labor will hinge on voluntary volition. If there is to be an Ecological Baroque, it will be built by willing hands. What would motivate hosts of volunteers? Why would they lend their time and talents to such collective efforts? If we return to Colonnade Park, we find the coming together of key components that were integral to making the Park a physical reality. First — and perhaps most importantly — someone had to recognize the latent potential of those couple of abandoned acres beneath I-5. In this case, that someone was a local bike shop owner, Simon Lawton, who was already riding his bike under the viaduct. Lawton’s rides convinced him that the site was perfect for a bike park. The freeway above sheltered it from Seattle’s persistent winter rains. The irregular but steep topography was well-suited to the introduction of circuit tracks without requiring extensive artificial grading, and, in its then-state of abandonment, the shadowed space was considered a safety hazard by the future park’s neighbors. Lawton took this vision to a series of local organizations and constituencies, including Seattle City Parks and Recreation, a local neighborhood council, Urban Sparks (a non-profit group specializing in kickstarting urban community projects), and, crucially, the Evergreen Mountain Bike Alliance, Seattle’s largest mountain biking advocacy and trail maintenance organization. 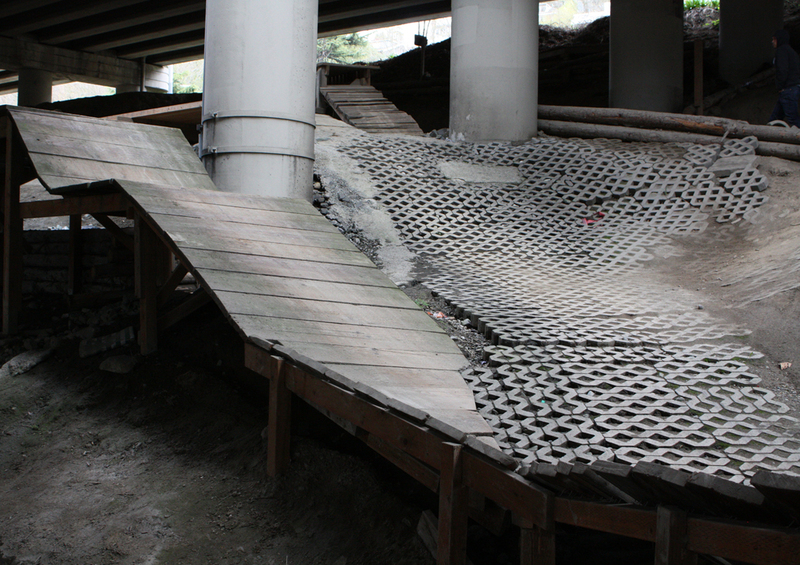 Once each of those organizations had been convinced that a bike park could and should be built beneath I-5, it was the Evergreen Mountain Bike Alliance that mobilized networks of resources — like the streams of surplus construction materials that were fashioned into the physical infrastructure of the bike park and communities of volunteers to construct it. Lawton’s creative opportunism provided the spark, and the presence of constituency that bought into that original creative vision generated a pool of labor that was both invested in the maturation of the vision and capable of pursuing the vision with a great deal of individual creativity. That is, the bikers wanted to ride in the future park themselves and as experienced bikers, the volunteers possessed an innate and specific understanding of the physical geometry of the future uses of the park. Neither of these things are true of the labor employed on the typical capital project. Like most labor in the Post-Fordist economy, the labor employed on capital projects is specialized, corporatized, homogeneous, and standardized; it is fundamentally ill-suited to craft, at once inimical to difference through standardization and resistant to holistic understanding because of the specialization demanded for economic efficiency. Freed from the constraints imposed by the dominance of capital, the pooled labor of groups of people defined by shared spatial proclivities — not just mountain bikers, but also skateboarders, soccer players, drag racers, parkour traceurs, rock climbers and boulderers, paintballers, and bird watchers — could begin to generate urban public landscapes which are more idiosyncratic and more differentiated than the public parks of the twentieth century. Similarly, the labor of knowledgeable and motivated ecological hobbyists could transform gardening from an individualistic and primarily ornamental practice into a communal effort, cultivating whole and diversified cities. Labor, which like the volunteer labor that built Colonnade Park, is uniquely motivated, local, and capable of imbuing its work with creative intent, falls outside the typical boundaries of landscape architecture as ‘professionally practiced’. And as these vested pools of labor fuse user, designer and builder they are more invested and broadly knowledgeable of its future use and how it will be occupied than the wage laborers of capital projects, opening diverse realms of possibility for the design of urban landscapes. The photos in this post are, unless otherwise specified, taken by Brett Milligan. The photos which are by Brett and not of Colonnade Park are from the Goats on Belmont project, which took advantage of a bit of non-human labor to cultivate change. This post is cross-posted at mammoth. The account of the construction of Colonnade Park that this piece is based on was pieced together from interviews that Brett conducted with Glenn Glover and Mike Westra of the Evergreen Mountain Bike Alliance. Thanks for the interest in the article. I enjoyed your piece bringing these ideas together with (potential) custom concrete fabrication practices.